DETROIT – For the 2018 edition of the team’s annual Hometown Holiday Assist, the Red Wings found a way to incorporate some local youth hockey players – and give them quite the surprise at the same time. Players from the Trenton Hockey Association were invited to the Meijer in Detroit to help members of the Red Wings, Lady Wings and colleagues from Olympia Entertainment shop for holiday gifts that the Wings will personally deliver to patients at the Children’s Hospital of Michigan next week. What the Trenton players didn’t know is that after finishing the shopping spree, they would go on another shopping spree – this time for themselves and their families. Then, as some hockey-centric icing on the cake, they returned to the original meeting room to find helmets, sticks and skates from Warrior and CCM waiting for them, as well. 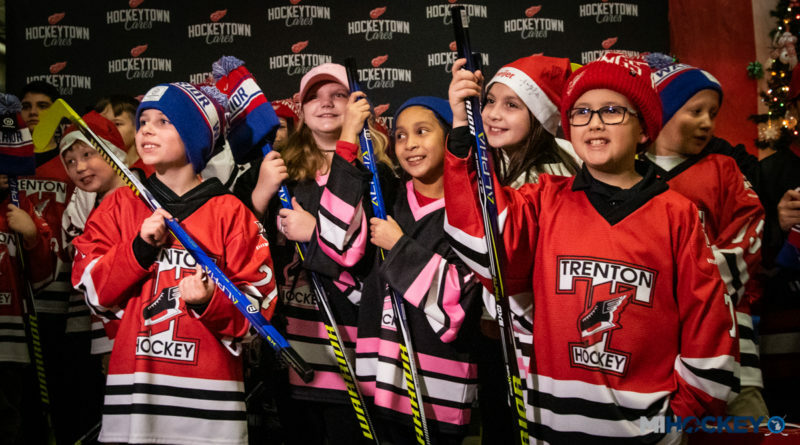 “We have 21 children from the Trenton Hockey Association, and they’ve all been chosen based on need,” said the Wings’ Kevin Brown, director of community relations. “The Trenton Hockey Association worked to find the kids who truly needed a special holiday this year. Jonathan Bernier, Tyler Bertuzzi, Trevor Daley, Martin Frk, Luke Glendening, Darren Helm, Jimmy Howard and Gustav Nyquist were on-hand to shop with the young hockey players. The kids had a pizza party before invading the toy section of the Meijer superstore. Glendening, the Grand Rapids native and University of Michigan alum, said it was great to help out members of the hockey community and families at Children’s Hospital at the same time. “Yeah it’s great,” Glendening said. “It’s cool to see that kids at such a young age have such a giving spirit around the holidays. They came here not knowing that they would be getting a shopping spree themselves, so it’s great to be here.